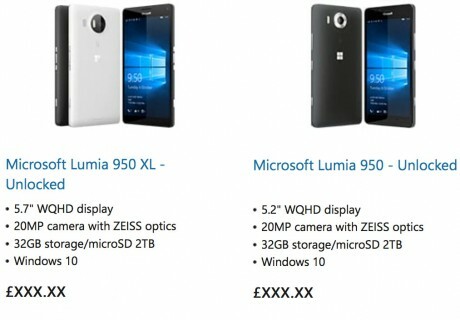 Microsoft revealed a few details about the unannounced Lumia 950 and 950 XL smartphones on its UK-based web site. The phones will be the first to ship with Windows 10 Mobile on board, Microsoft's new operating system. The web site lists only a couple of specs. Shared features include 20-megapixel cameras with Zeiss optics, 32GB of storage, and support for 2TB memory cards. The 950 sports a 5.2-inch quad HD screen, while the 950 XL offers a larger 5.7-inch quad HD screen. Microsoft is expected to announce the handsets in full at an event in New York scheduled for Oct. 6. I'd be really interested in a review of the 950XL. Maybe Windows 10 is the answer to some of the aggravations of Android that Google and Samsung don't seem to want to fix. I hope that Verizon be the one get this new windows phone. Having the icon is a grew but this 950XL looks better.